The man likely to be the next U.S. ambassador to Russia indicates that options for cooperation must remain open. On July 29, the U.S. Senate Committee on Foreign Relations held an unannounced meeting in which its members unanimously approved John Tefft’s nomination as the next U.S. ambassador to Russia. The recommendation must still be approved by the entire Senate, which could vote as soon as Aug. 1. Tefft emphasized that Russia and the U.S. have a long and complex history of relations. “We have been allies and we have been adversaries. We have cooperated and we have clashed. But the permanent relationship with Russia, her people and government, has been a constant, ” Tefft said. 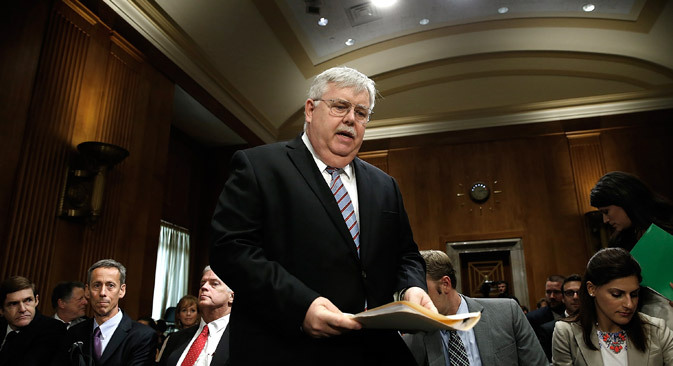 Tefft noted that Russia and the United States share common interests, ranging from dealing with terrorist threats to reducing the spread of nuclear material, as well as aviation and maritime safety. Alexander Konovalov, director of the Institute of Strategic Analysis, said that Tefft’s comments demonstrate an understanding of Russia’s realities. “Putin does not like to retreat, and the ambassador realizes that backing him into a corner will not be safe since he is capable of taking drastic steps in response,” Konovalov said. In his opinion, there is still hope for cooperation in areas where American and Russian interests coincide. Facing economic and political pressure, where does Russia go from here? “Tefft’s task today is to continue pressuring Russia and not to let the threat of war in Europe grow. He will have to help Putin find a solution to the current situation, in which Russia has no allies and the whole world is opposed to it,” Konovalov said. According to Andrei Kortunov, Director General of the Russian International Affairs Council, it is unrealistic to expect that a new U.S. ambassador will bring a clear change of course in relations with Russia, since the trajectory of Russian-U.S. relations is set by the White House and not by the ambassador. Kortunov said that Tefft will be cautious in his first days, so as not to cause doubts and suspicions in the minds of the Russian leadership. “Right now it seems to me that the issue is in how broad the space for action will be for the new ambassador. Will he have the opportunity to interact with a broad circle of Russian politicians, officials, and public figures? If Tefft’s social sphere is to be restricted, then, by all appearances, the opportunities for dialog on the development of bilateral relations will also be limited,” Kortunov said. Read more: Will Russia feel the pinch from the latest round of sanctions?